Every issue, landscape designer Darbi Davis digs deep to bring you stories for your outdoor space. 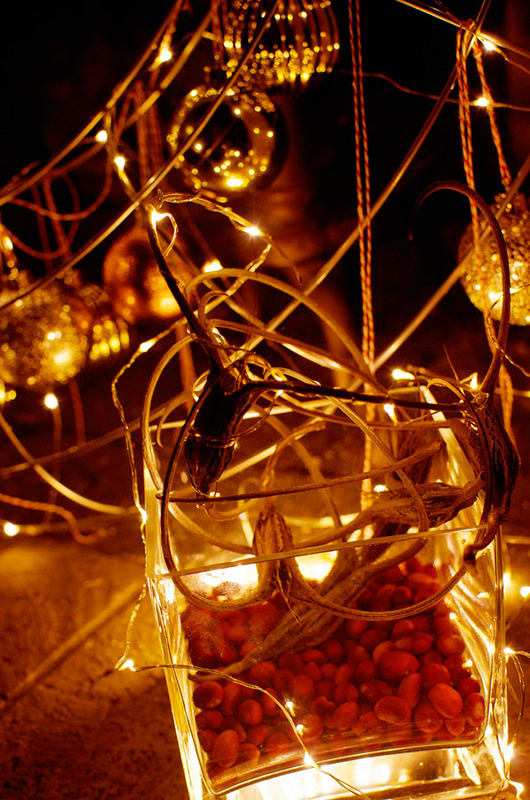 This month: tis the season for using ordinary desert plants as holiday décor. ‘Tis the season for bringing the outside in – and you can bet we’re not talking fresh wreaths, embellished evergreen garlands, or even chili ristras. When it comes to using desert plants and seeds as inside décor, there is extraordinary in the very ordinary. So don’t trash that deadhead, seedpod, rolling weed or cactus pad. Bring it inside! Paint it. Hang it. Gild it. It’s time to hit the streets with your clippers, snipers, grill tongs, and gloves in search of fabulous botanical finds to top your mantel, tabletop, or vintage long-horned cow skull. Whether a traditionalist or modernist, shades of red are likely a part of your spirited holiday palette. Instead of hiking to the local trading post in search of the perfect crimson star, take a stroll through your neighborhood or parking lot in search of the heat-loving, drought tolerant, Texas Mountain Laurel. 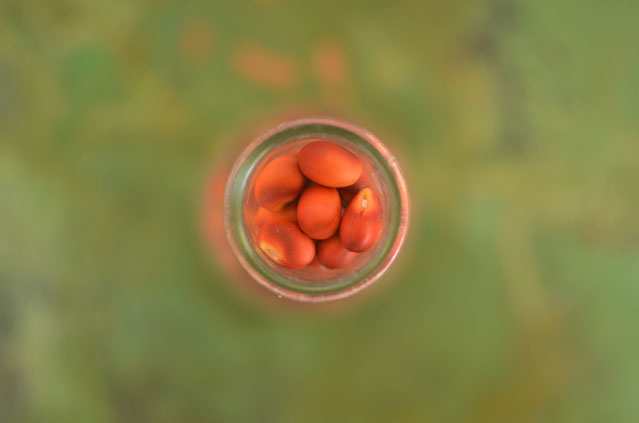 This time of year, their seedpods are filled with cherry colored seeds, yearning to tint your clear glass jar, accent your citrus-filled bowls or, if you are crafty and daring, to be strung side by side forming a garland of vermillion. 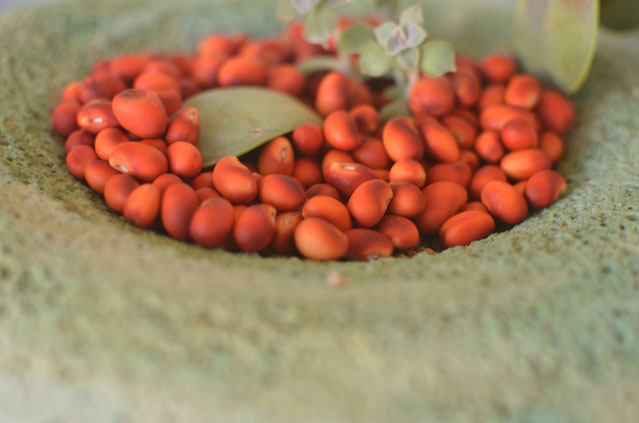 Keep in mind that the seeds of this lovely xeric-tree are poisonous if ingested. However, they must be crushed in order for their hallucinogenic properties to cause effect, and that’s a tough job. Slip on your gloves, grab your BBQ tongs, maybe a pruning saw, and collect a few prickly pear pads. Arrange them in a slightly overlapping pattern along a ring. Hang that lush, mint green living arrangement over your fireplace or your front door. When the season is over, toss it in an empty spot in your yard and watch new pads emerge forming a delightful accent complete with brilliant flowers and edible fruit! If they rot away, don’t worry. “Paint the dried, woody, web remaining to your heart’s content and turn it into a year round decoration,” says Mellow Lund of MAST store in Tucson. Devil’s Claw gilded in silver with tiny lights. Wondering what to do with all of the Devil’s Claw seedpods that sprung up this summer? 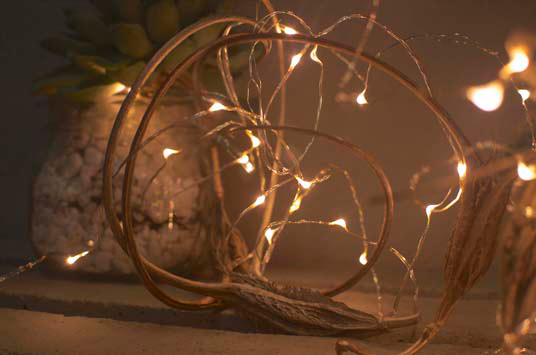 Grab a can of silver or gold spray paint and gild them into a brilliant, self-hanging menagerie of desert bliss! These pods have pokey, wooden tendrils curved at the absolute perfect angle, allowing them to dangle in delight – from anything that comes to mind. 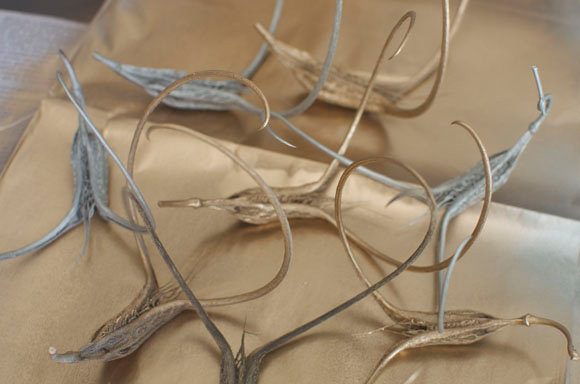 They can be ornaments for your tree, linked together for a golden garland, or woven into a wreath-like centerpiece. A tumbleweed tumbling along a dusty, barren highway and a pair of spurred cowboy boots are the classic symbols of desert life, and it may not be far from the truth – along with our lack of annual snowfall. Forget Frosty – get rural and gather a few tumbleweeds. Stack them as you please. Adorn with a cowboy hat and some spurred boots. Who needs snow for it to feel like winter is upon us? We like the dusty sunshine here in the borderlands! And if you’re more of purist living in the wild, wild, west, there are ways to incorporate a bit of evergreen into your holiday fun as well. Lisa Reeves, a Tucson interior designer and owner of Talents Design Studio, suggests: “Take cuttings from fruit trees or evergreen trees. Incorporate these cuttings into your centerpieces.” Olive, eucalyptus and rosemary provide a range of greens to choose from and are delightfully fragrant. So this year, freshen up your holidays quite literally. Take a walk with family, grab a branch, start gilding, get creative, and take some of the stress away from this time of year. Cheers!